Alan Williams 2000-2017 is the owner of the copyright for this website. The web server with the IP-address 143.95.38.81 used by Chillibidding.org is owned by Colo4, LLC and is located in Los Angeles, USA. This web server runs a few other websites, mostly in the english language. 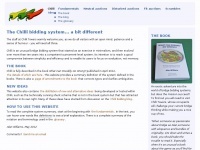 The websites of Chillibidding.org are served by a Nginx server. The HTML pages were created with the latest standard HTML 5.